← Could major housing developments be outside activity centres? Can Melbourne depend on infill housing? We know that the inability to increase significantly the supply of dwellings within established suburbs is a key failing of strategic planning in Melbourne. Simply put, there’s not enough housing to make established suburbs affordable for all the people who would like to live in a relatively accessible location. We also know that activity centres aren’t pulling their weight in the task of increasing supply (see here and here) and that the burden of supply is instead falling on small-scale infill development, much of it dual occupancy projects. So it’s worth looking further at the nature of infill housing. 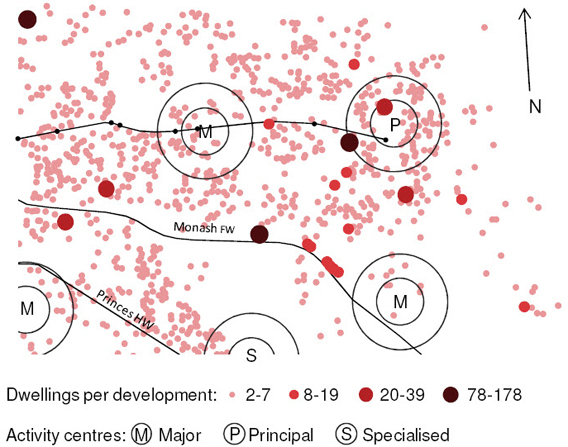 A study by Monash University’s Thu Phan, Jim Peterson and Shobhit Chandra , Urban infill: the extent and implications in the City of Monash, examined new developments in the municipality over the period 2000-06. They defined infill primarily as projects where two or more new dwellings were constructed on sites formerly occupied by detached houses. A total of 1,483 projects were identified, ranging in size from two dwellings to 178. The study revealed a number of interesting aspects about this middle suburban municipality. First, it found new dwelling supply is dominated by small projects. One project built more than 178 dwellings and three built between 40-77 dwellings, however 98% of projects involve just 2-7 seven dwellings (and we can be pretty confident they’re heavily weighted toward the smaller end). Second, projects are dispersed, not concentrated. As shown in the exhibit, proximity to major trip generators is uncorrelated with location of projects. Just 5% are within 400 metres of a Principal, Major or Specialised activity centre, and only 10% are within 400 metres of a rail station. Moreover, the authors found projects located within 400 metres of an activity centre are smaller on average than those in more distant locations. Third, developers tend to be opportunistic rather than strategic – they wait for properties to be offered for sale and assess each one on its potential for redevelopment. Thus the geography of infill development is shaped largely by what comes on the market rather than by any sort of deterministic planning policy. Fourth, the size of lots and the age of the existing house is a more important influence on the location of infill development than proximity to an activity centre or rail station. The average infill site is relatively large (700 to 900 sq m) and the majority of existing dwellings are relatively old i.e. built between 1945 and 1965. Lot sizes close to rail stations are smaller – and hence less amenable to redevelopment – than those further away, probably reflecting the different periods of development. Thus not only are activity centres failing to expand housing supply in accordance with the precepts of Melbourne 2030, but the great bulk of new housing being built in Monash isn’t located close to activity centres but rather is dispersed (relatively uniformly too judging by the exhibit i.e. non-randomly).The dispersed pattern will worry some, but I don’t see it as a big issue. One reason I’m reasonably relaxed is because the 400 metre standard is too stringent. Extending the buffer to 800 metres around an activity centre picks up 20% of infill projects and 800 metres around a rail station picks up 34%. That’s a big improvement, although it’s still a minority of projects. Another reason is proximity to public transport (except in the city centre) doesn’t have a big influence on travel behaviour anyway. But most importantly, households that locate in any part of Monash will exhibit more sustainable travel behaviour than they would if they had to locate on the fringe. To my mind, the key issue arising from the Monash study is that we are heavily reliant on huge numbers of very small infill projects to increase supply in established suburbs. At present, this strategy is delivering a lot of housing but it’s not enough – over half of the net increase in dwelling supply in Melbourne is still located in the outer suburbs. There seems to be limited scope to crank-up infill supply significantly. Existing residents don’t like their streets being changed by infill housing and Councils, not surprisingly, tend to act in accordance with their constituents wishes. Likewise, there’re few reasons to be optimistic that the supply of dwellings in activity centres will increase significantly. The nub of it is existing residents don’t see themselves getting a net benefit from redevelopment, at least within a plausible time frame. The two current models – i.e. higher density housing in activity centres and small-scale medium density infill – are only going to make a substantially higher and sustained contribution to supply if existing residents are prepared to accept more pain (or are compensated in some way). These are terribly hard choices politically. Next time I’ll talk about an alternative approach that might possibly avoid or at least minimise some of these problems. how can alans writings get a greater audience? regular article in planning news perhaps? Alan, what percentage of land in these areas is within 400 and 800m of stations? That’s the relevant comparison, rather than a bald statistic. Similarly, if you look at the Melbourne Atlas, the percentage of people travelling by train within 400m of a station is significantly higher than without. Some of that is a selection effect – people who need the train want to live near it. If we posit that people who work in the CBD ought to be able to live somewhere with reasonable <40min CBD p/t access, then the metric of relevance for suburban CBD orientated in-fill that ought to be used is "number of houses built with CBD p/t access divided by number of new CBD jobs". If that is going backwards then there is a problem (excessively long commutes), if not then, yay. Don’t know about rail stations, but six activity centres with a 400 metre buffer is equal to 4% of the City of Monash’s total area (81 sq km). Don’t know the area that’s just residential but say it increases the figure to 5% – that’s the same as the share of infill within 400 metres of activity centres. I’m not sure in any case that this is the relevant comparison. If there’s an assumption that medium density should be prioritised to activity centres, then it should be getting a disproportionate share. But it isn’t. Alan, it should be getting a disproportionate share, that is why it is the relevant statistic. If only 0.5% of land was in activity centres then that would be 10x as much development which is good, even if the overall percentage is still low; a 1-1 ratio of a/c housing to a/c land indicates that there is no discrimination between land types at all. From an adherence to the strategic plan perspective that is appalling. Not that this is surprising, activity centre land ought to have been rezoned with an activity centre zone that was permissive. By leaving it vague, ill-defined and inconsistent across municipalities they managed to simultaneously stymie Melbourne 2030 AND wreck the coherence of the VPPs. Yes, sorry Russ, I misunderstood your intention. A series of interesting and informing posts Alan, but I think Russ has nailed the important issues in this comment. Its no secret that Melbourne 2030 has failed its objectives, nor that Melbourne @ 5million is essentially a watered down version of the same thing (albiet with some minor improvements in definitions surrounding what an activity centre is). What is important is why Melbourne 2030 has failed its goals, whether the goals were admirable in the first place and what can be done differently to achieve them if they are admirable. I believe the goals were worthy, and that Russ has outlined some of the reasons for failure, and that the truly interesting discussions will revolve around how things can be done differently to achieve them. At the moment I can’t contribute much to that discussion its late and I should be going to bed, but I hope it can be had on this blog shortly. There is another element to this. The houses around activity centres and railway stations are usually more expensive and therefore owned by people who are better equiped financially, socially and educationally to defend their interests. Developers sensing this ability choose the easier option of developing in cheaper areas around people who may not like the increase in density but feel less able to mount an oppostion. The biggest concern I have with the new wave of unit development away from activities centres is the increase in on street parking. Many residents of unit developments have two cars and choose to park them in the street rather than in the garage which they prefer to use as storage space. I wouldnt put too much weight on a study of infill in Monash between 2000 and 2006 – just by looking at the increasing number of real estate ads for medium to large apartment developments in inner and middle ring suburbs in last few years (its 5 years since 2006) there must be now quite a large number of developments within 10K of the CBD over 20 units even excluding southbank and docklands – has anyone scanned more recent info ? (even DPCD figures 2004 – 2008 would look very different now). In fact there’s an article today in the Commercial Property section of the Age saying there might be an oversupply of such things, though no real evidence in the article – just some scary pics of massive looking things lining the river in Richmond and a 12 storey tower in – Frankston ! first of many down there I suppose if this one gets up (same prices as if it were in Brunswick strangely enough – guess its got views rather than location). You might think there was a lot built in the inner city (excluding MCC) in large developments but you’d be wrong. According to the DPCD statistical report I cited the other day, only 3,878 dwellings in projects of 20+ units were constructed in Port Phillip and Yarra municipalities combined during the four years from 2004 to 2008 i.e. <1,000 p.a. And Stonnington only supplied 928 i.e. <250 p.a. The City of Melbourne however supplied 8,719 – that's where the actions been, in the city centre.